Laura Tobón, Natalia Agudelo, Catalina Arroyave and Jaime Guerrero of Days of the Whale. 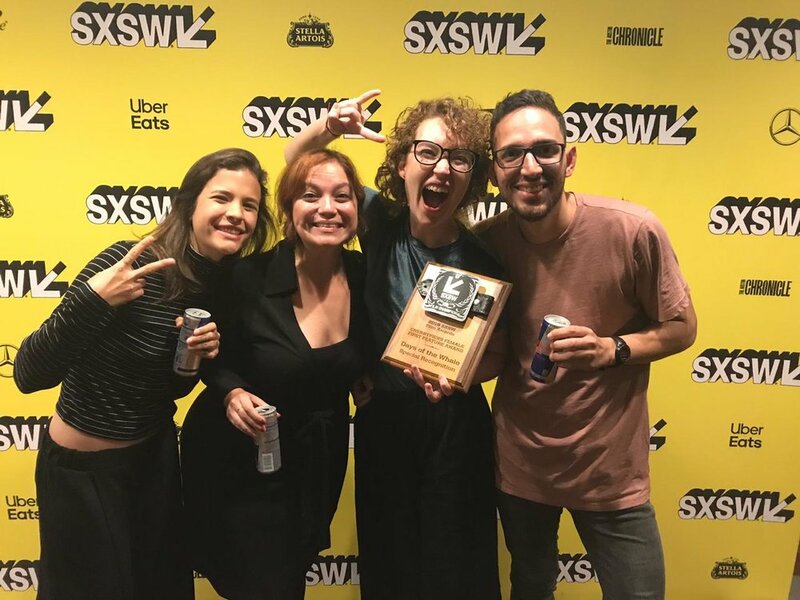 The SXSW Film Festival announced the winners of its 2019 edition, which includes several Latin American and U.S. Latinx filmmakers from different sections of the festivals. In the Documentary Feature Competition, Elizabeth Carroll’s Nothing Fancy: Diana Kennedy was the winner of the Special Jury Recognition for Excellence in Storytelling. The film follows the award-winning cookbook author, diehard environmentalist and feisty British nonagenarian Diana Kennedy who reflects on an unconventional life spent mastering the cuisines of Mexico. In the Narrative Shorts competition, the Brazilian short film Guaxuma by Nara Normande, about a beloved friendship that is gorgeously memorialized in sand from the Brazilian beaches of the filmmaker's childhood, was the winner of the Short Film Grand Jury Award for Best Animated Short. Another Brazilian short, The Orphan / O Órfão by Carolina Markowicz—inspired by true events and telling the story of Jonathas, who has been adopted but then returned due to his ‘different’ way—was the winner of the Special Jury Recognition in the Narrative Shorts competition. The music video Pa’Lante performed by Hurray for The Riff Raff and directed by Kristian Mercado, a powerful love letter to Puerto Rico in the aftermath of Hurricane Maria, was the winner of the Best Music Video Award, while Mexican-American James Ramirez received the Award for Excellence in Title Design for his work in the blockbuster Spider Man: Into the Spider-Verse. In the SXSW Special Awards, the Brazilian film Amazônia Groove directed by Bruno Murtinho was the winner of the ZEISS Cinematography Award. Leaving Belem and crossing much of the Para State Amazon region, its towns and riverside villages, Amazônia Groove reveals artists and their traditions, faith and mysticism, music and life that pound in the northern region of Brazil. The Colombian film Days of the Whale / Los días de la ballena directed by Catalina Arroyave Restrepo, about two young graffiti artists of Medellín who defy a criminal gang when they decide to paint the mural of a whale over a threat written in a wall, was the winner of the inaugural CherryPicks Special Recognition for Best Female First Film. Two Latin American films were the most popular of their premiering sections having won the Audience Award: Salvadoran documentary film Cachada: The Opportunity by Marlén Viñayo—about five Salvadoran saleswomen that take their cruel life stories to the stage—was the Audience Award in the Global section, while The Garden Left Behind by Brazilian director Flavio Alves—about a Mexican trans woman struggles to build a life for herself as an undocumented immigrant in New York City—was the winner of the Audience Award in the Visions section. Lastly, in the Virtual Cinema competition, two projects directed by Argentine filmmakers were the winners of the Jury Award: the 3D real-time animated VR experience in 6DOF Gloomy Eyes by Jorge Tereso and Fernando Maldonado for Best Storytelling, and Metro Veinte: Cita Ciega by Maria Belen Poncio, about Juana, an 18 year-old girl bound to a wheelchair who is anxious to explore her sexuality, for Best 360° Video: Narrative.